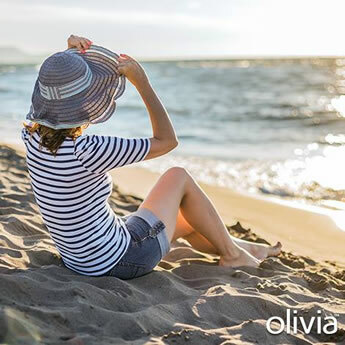 Get ready to set sail to historic Cuba with 1,300 of your closest Olivia friends as we celebrate the 30th Anniversary of Olivia Travel! Spend a full day and night in Havana—cruise the Malecon in a Classic Car; discover the art of savoring Cuban coffee, rum and cigars; visit Hemingway’s home, haunts and inspirations, or revel in a night of music and dance at a Cuban Cabaret. Next, we will sail around the southern coast of Cuba to Cienfuegos, known as the “Pearl of the South.” This UNESCO site will charm you with its mix of French neo-classical architecture and Afro-Cuban spirit. 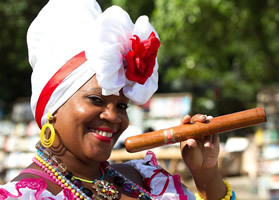 Learn about classical architecture and Afro-Cuban spirit. Learn about its rich history as a hub of art, music and commerce or take a trip to nearby Trinidad or Santa Clara. 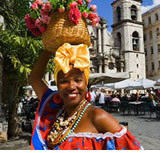 Dive deep into the culture and history of Cuba with our carefully curated tours and then explore each port to your heart’s desire! We will continue our cruise to popular Georgetown in the Grand Cayman Islands and our final stop is in Cozumel, the heart of the Mayan culture. Round-trip from Fort Lauderdale, FL, this cruise is the perfect time to escape the cold and enjoy the sun-kissed days and star-filled nights. Combine this unique itinerary with a stellar Anniversary line-up of entertainment, along with the incredible Team Olivia, and you’ll be on your way to a vacation you won’t forget! 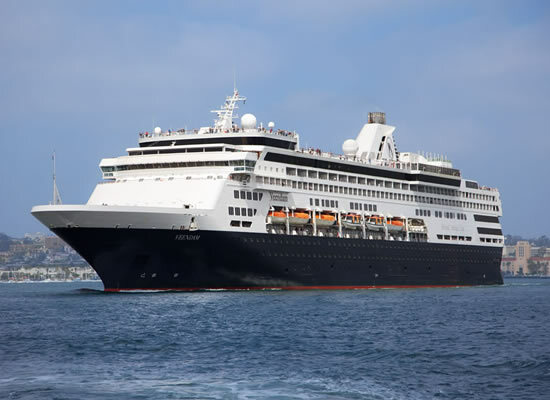 Revel in the ms Veendam's spacious ship rooms, breathe in expansive views and relax in easy elegance. 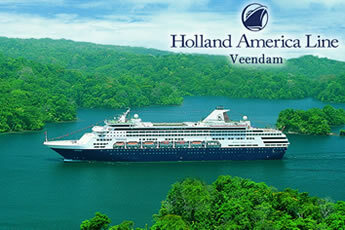 With stately fine dining and enriching activities, we are thrilled to be sailing on Holland America’s ms Veendam. Grandly proportioned and recently enhanced, Veendam combines 21st-century amenities and elegant spaces graced by a multi-million-dollar art and antiques collection. Choose from six dining venues— The Dining Room, Lido Market, Dive-In, New York Pizza, Pinnacle Grill (nominal charge), Canaletto (nominal charge)—plus 24-hour room service. Enjoy a beverage from one of the many lounges and bars, two swimming pools, Jacuzzis, The Greenhouse Spa and Salon, fitness center, casino, internet café, on-board shops, America’s Test Kitchen with live cooking shows and workshops, nightly entertainment at The Main Stage, and more. • The Digital Workshop, powered by Microsoft Windows – Learn how to share your digital memories through email, blogging and social networking - so friends and family can see where they've been cruising even before they return home. Free workshops taught by Microsoft-trained "techsperts" make it easy and fun. • Greenhouse Spa & Salon – features heavenly beauty and wellness rituals. Enjoy a facial, a hot stone massage, and have your hair and nails done for a special evening. 28 Jan Day at Sea! Welcome to Fort Lauderdale! Shimmering blue waters, swaying palm trees and soft ocean breezes greet you in Fort Lauderdale, Florida, where you'll find yourself somewhere between laid-back island time and the fast pace of a thriving city. There is an abundance of things to see and do in the area: visit the Fort Lauderdale Beach and cafés, stroll the historic Riverwalk, shop the luxurious stores on Las Olas Boulevard or venture to the Everglades for an intriguing air boat excursion. While most Americans have never been there thanks to the U.S. government’s embargo of Cuba which started in 1962, the very word Havana still evokes a set of specific images—candy-colored vintage cars puttering along picturesque streets; smiling musicians playing familiar tropical tunes whose rhythms are so infectious that nearly everyone is seduced into dancing; cigar-smoking and rum-sipping locals against a palm-fringed background. There’s a reason these have become the stereotypical visual symbols of Cuba’s capital city, but dive beneath the surface and you’ll find so much more: world-class sports matches, centuries-old historic sites and even a Chinatown in midst of a cultural revival. In Havana, you can find plenty of delicious dishes served in friendly casual restaurants run out of private homes or in more-upscale spots with city and water views. As for shopping, you’ll definitely be able to purchase unique souvenirs to take home, from photo books about Cuban culture sold at the island’s only English-language bookstore to a hand-blended perfume or cologne packaged in a bottle that looks like a throwback to another era. The city of Cienfuegos is also the capital of the province of the same name. A port city on Cuba’s southern coast, Cienfuegos has played an important role in Cuba’s history since it was founded in 1819, when the island was still Spanish territory, and today it remains one of the country’s important commercial centers—a transit point for coffee, sugarcane and tobacco. It has both welcomed and resisted incursions from various people and interests over the past two centuries. 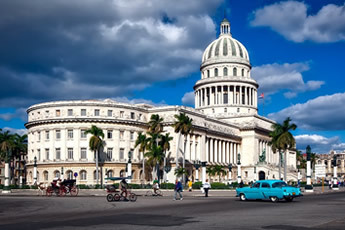 Both as the heart of Cuba’s sugar industry and as the birthplace of famous Cubans past and present, such as singer Benny Moré and baseball stars José Abreu and Yasiel Puig, the city looms large in Cuban consciousness, but it isn’t always on visitors’ itineraries, which is a shame. Cienfuegos boasts numerous attractions that give a fuller, more complex view of Cuban life, culture and history. This fact was recognized by UNESCO in 2005, when the organization inscribed the old center of Cienfuegos, with its many stately neoclassical buildings and “harmonious overall townscape” (to borrow UNESCO’s description), onto its World Heritage List. The Cayman Islands have everything you would want from a Caribbean destination—warm breezes, clear seas and a laid-back attitude—but the archipelago also has something you might not expect: an exciting culinary scene. Between the celebrity chefs who’ve set up shop on Grand Cayman and the 135 or so resident nationalities that have helped season the island’s giant melting pot, this is, hands down, one of the best places to eat in the Caribbean. In and around George Town, the Cayman Islands' capital, you’ll find such an amazing array of culinary offerings, you’ll fear for the future of any buttons, snaps or hooks on your waistband. And that’s where the island’s other chief pleasures come in: There’s enough walking (whether along the fabled Seven Mile Beach, around historic sites or through lush gardens) as well as stunning swimming, snorkeling and diving to be done to counter the effects of... So. Much. Good. Food. Or at least you can begin to. Oh, and one warning: Should you wind up at Rum Point—Grand Cayman’s castaway beach imago—there’s a good chance your ship is, by your own design, sailing without you. Start your day off with a splash! Cozumel Island is one of the world’s premiere dive spots; the northern part of the Mesoamerican barrier reef lies just 200 yards off the shore. Snorkel above or dive alongside the reef for a chance to see exotic fish, lobsters, crabs, eels, stingrays and other sea critters. For those more akin to land, take a ferry across the channel to Tulum, where beautiful Mayan ruins sit perched on dramatic sea cliffs overlooking the Mexican Caribbean. Take in the views of Caribbean with some friends and drink a glass of wine. Or join in one of the dozens of activities the Olivia team has planned just for you! 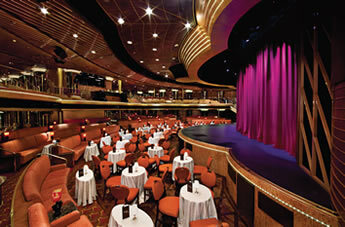 Take a dance lesson, play bingo, head to the casino, or treat yourself to a spa day...the choices are nearly endless! 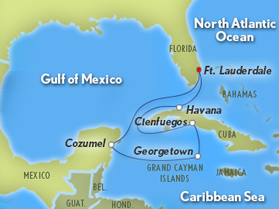 Today, you’ll disembark in Fort Lauderdale and either head home or enjoy Ft.Lauderdale for few more days. Navigation Deck. The Pinnacle Suite is the largest most luxurious accommodation on the ship. With approximately 1,273 square feet, including verandah, this Suite features a bedroom with one king-size bed, living room, dining room, dressing room, pantry, mini-bar, refrigerator, guest toilet, one sofa bed that accommodates two additional guests, oversize whirlpool bath and shower, floor-to-ceiling windows and private verandah. Navigation Deck. The Neptune Suites offer the most spacious accommodations next to the Pinnacle Suite. Indulge, unwind and relax in the comfort of this expansive suite. These suites feature two beds convertible to one king-size bed, one sofa bed that accommodates two additional guests, whirlpool bath/shower, large sitting area, dressing room, mini-bar, refrigerator, floor- to-ceiling windows and private verandah. Naviagation Deck. Pamper yourself with a verandah where you can enjoy spectacular ocean views while indulging in room service in the comfort of your suite. These suites feature two beds convertible to one queen-size bed, whirlpool bathtub/shower, sitting area, floor-to-ceiling windows, private verandah and all standard oceanview stateroom amenities. Approximately 283 square feet including verandah. Navigation, Verandah Decks. Pamper yourself with a verandah where you can enjoy spectacular ocean views while indulging in room service in the comfort of your suite. These suites feature two beds convertible to one queen-size bed, whirlpool bathtub/shower, sitting area, floor-to-ceiling windows, private verandah and all standard oceanview stateroom amenities. Approximately 283 square feet including verandah. Verandah Decks. Pamper yourself with a verandah where you can enjoy spectacular ocean views while indulging in room service in the comfort of your suite. These staterooms feature two beds convertible to one queen-size bed, whirlpool bathtub/shower, sitting area, floor-to-ceiling windows, private verandah and all standard oceanview stateroom amenities. Approximately 244 square feet including verandah. Lower Promenade Deck. 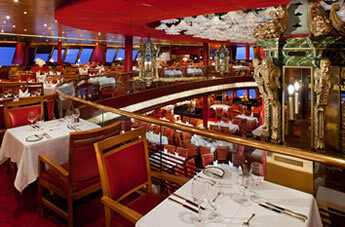 These staterooms offer sliding glass doors that lead onto the walk- around lower promenade deck. 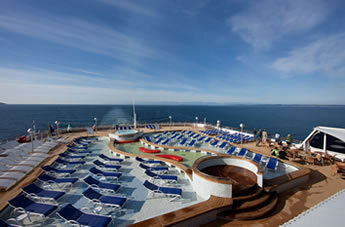 Rooms include two beds convertible to one queen-size bed with bathtub/shower and all oceanview stateroom amenities. Approximately 181 – 256 square feet. A, Lower Promenade, Main Decks. These rooms offer an ocean view with a window for natural sunlight. Rooms include two beds convertible to one queen-size bed with bathtub/shower and all standard oceanview amenities. Approximately 174 – 255 square feet. Book now to get $700 pp off Early Bird! Lower Promenade Deck. These rooms have either a partial window view. Rooms include two beds convertible to one queen-size bed with bathtub/shower and all standard oceanview amenities. Approximately 174 – 255 square feet. A, Main Decks. These rooms have either a partial window view. Rooms include two beds convertible to one queen-size bed with bathtub/shower and all standard oceanview amenities. Approximately 174 – 255 square feet. Lower Promenade Deck. These rooms have either a partial or obstructed window view. Rooms include two beds convertible to one queen-size bed with bathtub/shower and all standard oceanview amenities. Approximately 174 – 255 square feet. Lower Promenade, Naviagation, Verandah Deck. Interior staterooms offer a comfortable sleeping environment and include two beds convertible to one queen-size bed with shower and all standard amenities. Approximately 141 – 226 square feet. Verandah Deck. Interior staterooms offer a comfortable sleeping environment and include two beds convertible to one queen-size bed with shower and all standard amenities. Approximately 130 square feet. A, Main Decks. Interior staterooms offer a comfortable sleeping environment and include two beds convertible to one queen-size bed with shower and all standard amenities. Approximately 141 – 226 square feet. Main, Navigation, Verandah Decks. Interior staterooms offer a comfortable sleeping environment and include two beds convertible to one queen-size bed with shower and all standard amenities. Approximately 141 – 226 square feet. Rates: Prices are per person based on double occupancy. Pricing does not include airfare, insurance, fuel surcharge or NDA charges of $399 (subject to change). 3rd/4th person occupancy is $799 pp plus NDA charges. Early bird prices valid until June 15, 2019.